Florence, Uffizi, inv. 1890 no. 1305. Panel, poplar, 37.8 x 45. The dimensions given above are of the panel without its additions on all sides. From the back can be seen at the top an addition of 1.35 cm., at the bottom another of 1.4 cm. ; again from the back, at the left a strip of 0.8 cm. is added, at the right two strips, of 0.9 cm. and 0.3 cm. The edges of the original panel are smooth. Its breadth is 2.5 cm. The panel may have been thinned.1 The grain of the single piece of wood is vertical and there are two vertical cracks also visible on the front of the panel. From the front one vertical crack in the panel is visible in the surface of the paint about 12 cm. from the left edge; it is straight and continuous from top to bottom with a circular dent at the bottom. The second crack that is visible in the surface of the paint is in the center of the panel and is also continuous from top to bottom but on a slight diagonal slanting from left to right. 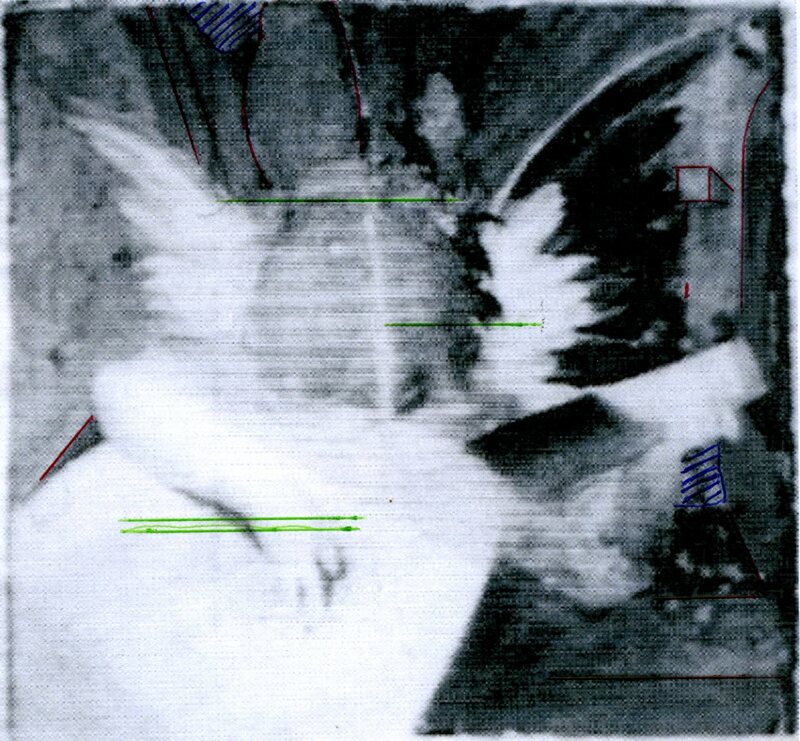 There is very much repainting along this center crack that is visible to the naked eye but is very much more evident in a reflectograph (Fig.Reflectograph85) published by Natali (see below) that also shows a round spot that has been repainted just to the left of this crack near the top of the angel’s head. Furthermore, the reflectograph shows that the entire background of the picture above the lute and the figure has been repainted. This is also visible to the naked eye and appears especially heavy above and to the right of the angel’s head. The whole area of the background at the lower right is also repainted. 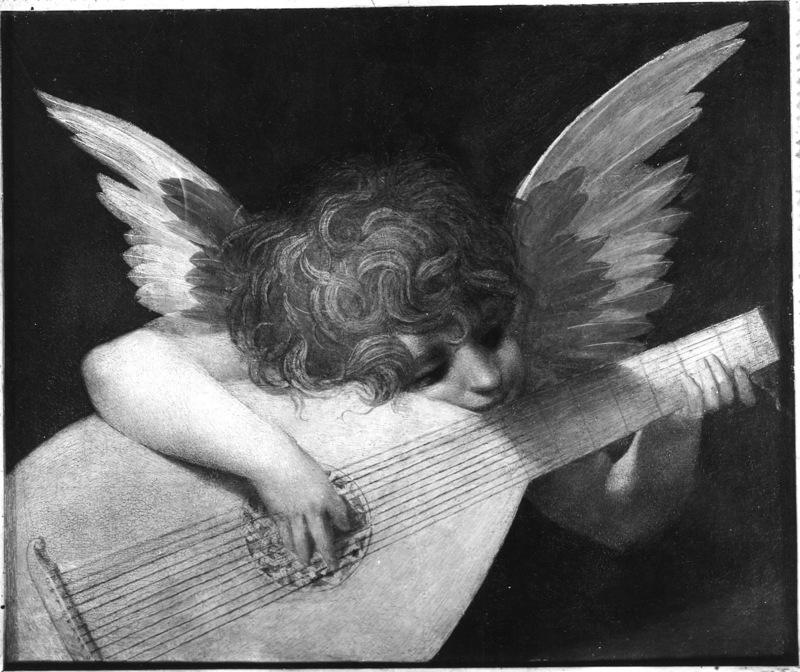 It is further possible that the shadow cast on the arm of the lute, that is very dark in the reflectograph, and the shading or some of it on the angel’s left arm are additions. From this reflectograph and from a later and better one made a decade later (Fig.Reflectograph96) it can be seen that originally there was something at the sides of the angel, possibly parts of two figures one with a staff and the other with part of a wheel of St. Catherine of Alexandria, first detected and published in 1985 by Antonio Natali. On the surface of the painting itself there is clear evidence of horizontal incisions in the gesso ground of the panel (here marked in green on the later reflectograph, (Fig.Reflectograph96b). Two, about 2 cm. apart, run across the angel’s wrist of the hand plucking the strings. A single but broken incision crosses the forehead of the angel. Another passes through the very top of his head. These and other incisions are of the kind that mark the size, placement and edges of the steps in the S. Maria Nuova Altarpiece, in the Dei Altarpiece, and in the Marriage of the Virgin. 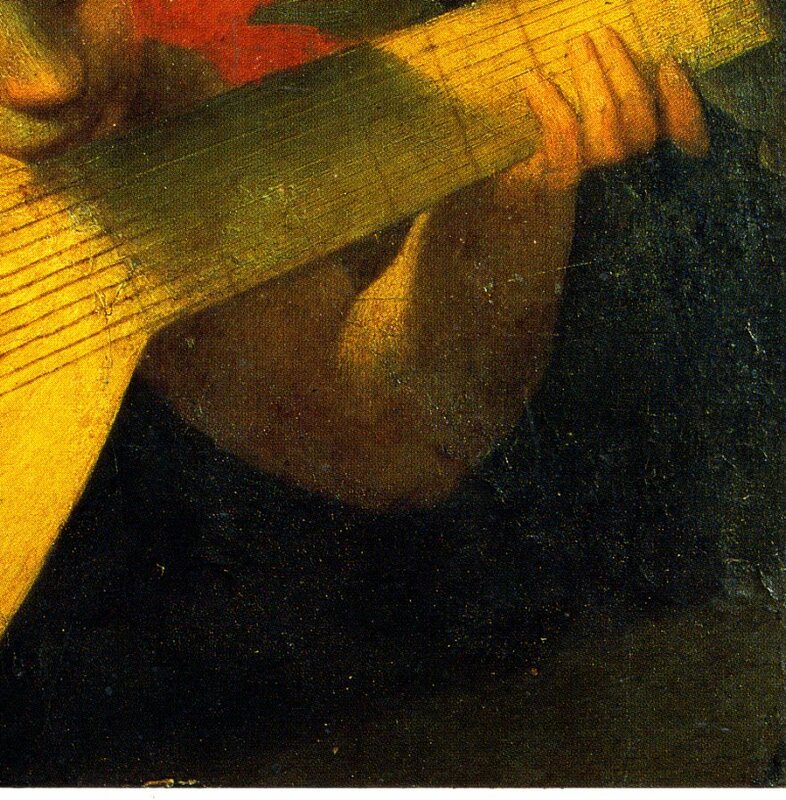 At the far right (left from the back) a crack in the surface of the paint marks the join of the added strip; at the left (right from the back) just inside the frame can be seen an added strip that is painted dark brown and does not show anymore of the lute. The angel’s hair is light brown; his wings are olive gray with the inner feathers red orange. The shadows of the face have a greenish cast with the cheeks and tip of the nose pinkish. The eyes are black. The lute is yellowish tan. A small part of its receding peg box is barely visible in shadow cut off by the right edge of the panel. The repainted background is a very dark green, almost black, with the lower right corner black and dark gray where a passage of light seems indicated. Two-thirds of a braccio is about 39 cm., almost exactly the height of the Uffizi panel, and close enough in the rounded off measurements of the large inventory to match the more precise modern measurements of this almost square painting. The “adornamento di giaccherandi overo granutiglio” would seem to refer to the picture’s frame of a kind of limewood or linden (tiglio) or of the wood of the bread-fruit tree (giacchera). The existing frame may be the same one given in the inventory (see below). From the files of the Uffizi the attributions of this picture in the various subsequent inventories are: Inv. 1635–1638, to Beccafumi (AGF, MS. 75, c. 45, no. 453);2 the same attribution in the inventories of 1704 (no. 253) and 1753 (no. 2581); then again to Rosso in 1769 (no. 2920); in 1784 to Francesco Vanni (AGF, MS. 113, c. 230, n. 426); then again to Rosso in 1825 (no. 166) and in 1890 (no. 1505). Reproduced as Rosso’s in L’oeuvre originale de Vivant Denon… aver une notice… par M. Albert de la Fizelière, Paris, I, 1873, no. 16. Berenson, 1896, 129, as Rosso. Pieraccini, 1912, 61, no. 1241. Kusenberg, 1931, 14, 128, 183, n. 29, as Rosso, around 1518, about the same time as the S. Maria Nuova Altarpiece. He remarks that the figure strongly resembles the angels in Rosso’s Assumption. Venturi, 1932, IX, 51 204–206, 207, Fig. 115, 230, as Rosso, done five years after his first altarpiece, and as recalling Piero di Cosimo. Kusenberg, 1935, 62, as attributed to Rosso, around 1518. Becherucci, 1944, 27, as Rosso. Barocchi, 1950, 26–27, 245, as Rosso, 1514–1515, close to his female portrait in the Uffizi. She sees in its color the influence of Sarto and Piero di Cosimo, and in its theme the influence of Fra Bartolommeo, suggesting for comparison the angels in his altarpiece in the cathedral of Lucca and in his Marriage of St. Catherine, by which she seems to mean the altarpiece in the Pitti, and not that in the Uffizi as she states. Berenson, 1963, 194, as Rosso. Carroll (1964) 1976, I, Bk. II, 17–19, 22, 43–44, 51, 106–107, P. 7, II, Bk. III, Fig. 10, as Rosso, around 1515–1516. Becherucci, 1965, 40, no. 6, as Rosso, and valued at $20,000. Shearman, 1965, I, 167, n. 2, as Rosso, and as a fragment. Borea, 1965, Pl. II, as Rosso, around 1517, and as an independent picture. Mostra Storica, 1970, 6, 26, 37, 40, n. 29, as in the Tribune of the Uffizi in 1605, 1638, and again in 1970. Becherucci, in Uffizi Cat., 1979, 460, P1374, as Rosso, and of uncertain date. She interprets Venturi, 1932, as indicating a date of 1522, and herself as having dated it the same in Becherucci, 1944. She also states that the carved and gilt frame is perhaps of the seventeenth century. Caron, 1983, 5–8, as an independent painting by Rosso made as a gift to Leo X and perhaps given to him on November 30, 1515 during his triumphal entry into Florence. Natali, 1985, 41–43, 210, published three reflectographs of the painting that show details in the background, possibly part of a staff and part of the wheel of St. Catherine, indicating that originally there were parts of two figures (saints) behind the angel that have been painted over parallel incisions indicating steps. Hence he concludes that the small picture must have been cut from an altarpiece that he would date by comparison with the angels in the S. Maria Nuova Altarpiece toward 1518 or a little before. Wilmes, 1985, 94–95, 96, 145, Fig.4, as an early work by Rosso like the female portrait in the Uffizi. Carroll, 1987, 16, 33, n. 29, as a fragment of an altarpiece done in 1514–1515. Ciardi and Mugnaini, 1991, 86–89, no. 14, with 2 Color Pls., 116, as Rosso, as resembling the Volterra and Villamagna altarpieces or done between 1522 and 1524 in Florence. Franklin, 1994, 17, 50–51, Color Pl. 39, 53, 69, as a fragment of an altarpiece and although generally dated before the S. Maria Nuova Altarpiece of 1518 stylistically it seems later, c. 1519–1520, or 1523–1524, two dates when Rosso abandoned Florence, hence the altarpiece also abandoned perhaps the result of a conflict similar to that related to the altarpiece of 1518. Marchetti Letta, 1994, 30, 31, Color Pl. 37, as a fragment, done c. 1522. Brilli, 1994, 61, Color Pl., 62, mentioned the recent discovery that it was part of an altarpiece with the angel at the foot of the Virgin. Falciani, in Gnocchi and Falciani, 1994, 65, Color Fig., 67, as c.1522–1523. Natali, 1994 (1996), 169, 214, Fig. 93, 171. reported on and reproduced a reflectograph made in June of 1996 with more up-to-date instruments than those used in 1985 an image showing more clearly the staff and the wheel of St. Catherine of Alexandria. Natali also mentioned that infrared images revealed the step on which the angel is seated. Furhermore, in a note he reported that there was also revealed by the newer instruments the signature of Rosso and the date 1521. Carlo Falciani, in L’Officina della maniera, 1996, 350, no. 129, 351, Color Fig., 1521. 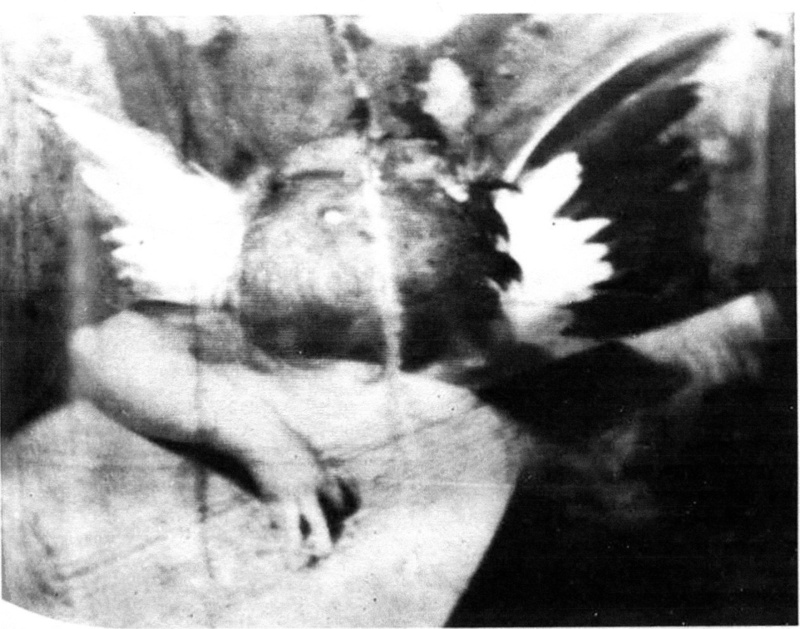 Mentions Antonio Natali’s conclusions from the evidence of a reflectograph and surface incisions that the picture was part of an altarpiece not mentioned in the sources or the literature. A new and finer reflectograph has made possible the reading at the lower right near the edge of the lute: “R[u]beus florentin[?] f[?]c[?] MDXXI,” the signature of which is much abraded and faint. Falciani brings up the problem of how such a signature by Rosso, done with the point of a brush, should survive in such a compromised part of the picture. From the present data Falciani offers several observations related to Rosso’s names in his Marriage of the Virgin, the formal signature on the steps and his name in the book held by St. Apollonia. A hypothetical conclusion may be that the signature was written on the small picture when it was cut from the altarpiece, at the same time that una balaustra was added on which the angel rested his elbow. A future restoration would allow for comparisons with the St. John the Baptist in a private Florentine collection and with the two altarpieces of 1521 in Volterra. From a cleaning might emerge added colors by Rosso and formal changes. 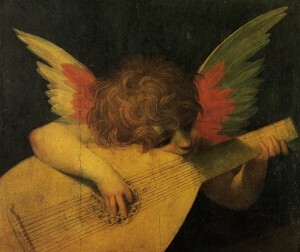 Falciani concludes that the painting may have been done far from Florence, as the adjective “florentino” makes one suppose, and remarked by Ciardi in 1987 with regard to Rosso’s signature on the Volterra Deposition, and added to his name on the Angel Playing a Lute upon his return from a stay in Naples that Natali suggested in 1995. Franklin, 1997, mentioned “the most important discovery” of the date of 1521, “apparently found by reflectography” on the Angel Playing a Lute. The earliest reference to this painting is the inventory record of it in the Tribuna of the Uffizi in 1605 with an attribution to Rosso although the statement in this entry “come al quaderno D secondo” suggests that this attribution goes back to a previous record. This attribution would seem to be a traditional one for as Natali has suggested with its background repainted “un conoscitore del 1605 avrebbe trovato non poche difficoltà ad assegnare il piccolo musico al Rosso.” Although in subsequent inventories an attribution to Beccafumi appeared, Rosso’s name reappeared in 1769. In 1784 the painting was given to Franceso Vanni but since 1825 it has held its attribution to Rosso. The similarity of the small figure to the angels in Rosso’s Assumption and to the two in his S. Maria Nuova Altarpiece virtually guarantee Rosso’s authorship. The angel’s head is all but identical to that of the angel at the lower left of the Virgin in the fresco of 1513–1514. However, it is just possible that the Uffizi painting is later for it shows a clarity of form, a linear design, and crisp details that are different and that suggest a slightly more mature moment, even as one must consider the repainting of some of the locks of the angel’s hair. Unfortunately, there is no other painting with a similar subject to compare it with until the altarpiece of 1518. But the Angel Playing a Lute cannot be that late as it too much resembles the angels in the Assumption and not nearly so much those in the considerably later painting. The small painting would seem to have been done after, but not long after, the fresco, perhaps in the second half of 1514 or in 1515. But given its similarity to the angels in the fresco of 1513–1514 it is difficult to imagine that it was done after 1515. The small size of the panel, its subject, and the extent to which it fills the panel, certainly indicate, as Shearman suggested in 1965, that the painting is a fragment. This has now been confirmed by the reflectographs published by Natali. As the details that they show are above and to the sides of the image of the angel and cannot be seen anywhere beneath the paint surface of the angel itself, or of its wings or the lute, that would indicate the reuse of a panel on which something has already been painted, it must be concluded that the panel of this painting was once part of a larger picture that included the angel and the details that can be seen in the reflectographs. Caron’s statement (1983, 8, n. 10) that “examination of the work outside of the frame indicates that it was not cut down from a larger painting” is a misinterpretation of what can rather be observed as evidence that the panel was cut out and its edges reworked by slight additions . The vertical direction of the grain of the wood of the panel would alone seem to indicate that the panel was cut from a larger vertical plank for one might rather expect the grain to run in the direction of the slightly longer width of the panel if it had been shaped from new wood for an independent picture. It should also be pointed out that neither Caron nor any earlier writer, including myself, made any attempt to show that such a painting of this size, subject, and format was even possible in the early years of the sixteenth century. For a more on the details of this picture, a consideration of the altarpiece to which the panel belonged, and a discussion of the signature and date inscribed on it, see L.11. 1The thickness of the panel was kindly measured for me by Dr. Antonio Natali who suggested that the panel may have been thinned. 2 Specifications here and for the 1784 inventory below are from Natali, 1985, 43, ns. 3–4.